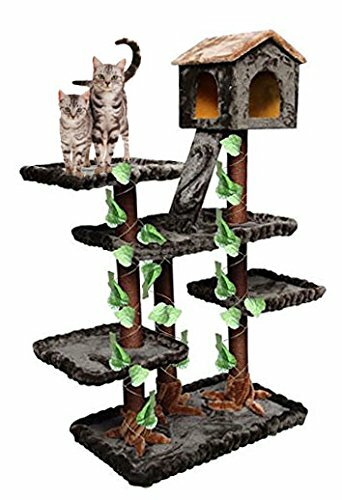 If you’re like me, you’ve probably spent much too much time thinking about cat trees. 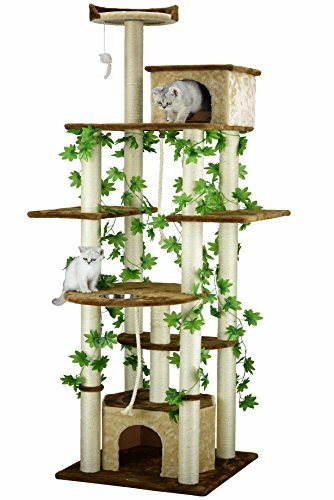 But one day I realised I wanted a cat tree that looks like a tree. You know, a real tree. 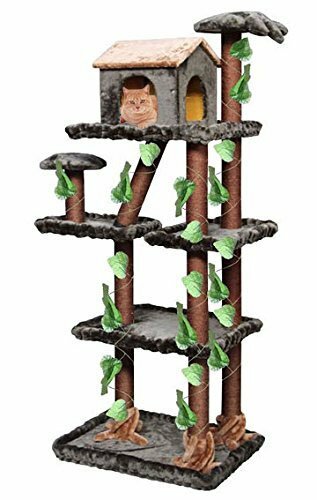 I wanted my cats to get more exercise while indoors, and I always thought that if I were a cat I’d love a complicated cat tree, the sort with walkways and pipes and tubes and slides. Basically a Google office but for cats. Here are some of the models I looked at before buying, and some that our experts have recommended to me. They have their pros and cons but they’re all good enough. The number 1 pick is clearly the best, but choose the one that fits you and your cat, and prepare for lots of fun times! This thing is great fun! 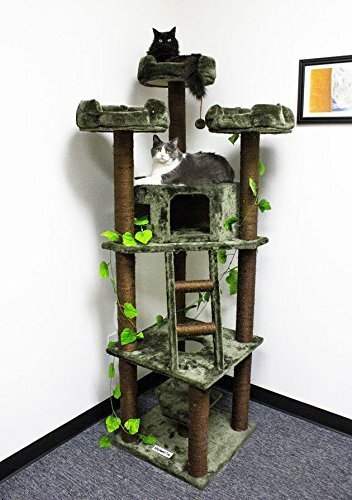 It’s 73 inches tall and has different levels so cats can share it. Covered in leaves, it looks tree-ish. The little hut on the top encourages your cat to leap and bound all the way to the top – exercise! There are plenty of scratch posts built in, which might help keep your kitty away from destroying your couch. The soft plush covering feels nice and gives your room a cozy texture, while it’s still fairly easy to clean. Assembly is easy and there are instructions and tools provided to help with that. It’s not one of the top sellers – probably because it’s a bit more expensive than some of the other options. It’s really good, though! Dimensions are 27 x 20 x 73 inches. This is from the same company as the number 5 option – CozyCatFurniture – which is why it looks so similar! It’s very much the same kind of thing but with a different design. The differences? It’s shorter – 65 inches (compared to 73) and has a ramp going from a lower level to the ‘alpha hut’. The base is also 27 x 20 inches but it feels a bit wider and there are two ‘peaks’ which you might prefer if you have two uppity cats who both think they are king of the castle. As with the #5, it’s easy to clean and easy to assemble. The main point in its favor is the slightly lower price. Now this one REALLY looks like a tree! When I first saw it I thought On2Pets was trying to sell me a small bush! In fact, it’s called a cat condo and I LOVE IT. If you look behind the leaves, you’ll see there’s a whole cat fun house behind. It’s all very simple – just a few few platforms where cats can sneak away and have a nap, and peek out through the leaves. Maybe pretend to hunt a bird or two. But it looks great in all kinds of rooms and it really fits with the natural predilections of felines – hiding, hunting, scratching, sleeping! It’s been designed and assembled in the USA, and measures 24 x 24 x 60 inches. Note – we found it perfectly well-made (if a bit wobbly) but some people have reported their model being a bit flimsy. Some bad batches coming out of the factories? Now you might look at this and say ‘hey that’s just a normal cat tree with some leaves stuck on’, and you wouldn’t be wrong! But believe me, your cat won’t mind. It still gives off enough of a tree-like vibe to provoke curiosity and the need to nest and whatever else cats do. Coming from CozyCatFurniture you know it’s going to be easy to assemble and clean. This one is 75 inches tall, and it comes with three dramatic ‘peaks’ complete with soft, fluffy beds. Literally cat heaven! Assembly tips – take your time, don’t rush it, and lay out all the parts before you get started. The supports are made of thick cardboard tubes so the whole thing ends up being very stable and able to cope with fat cats. This is GREAT if your cat enjoys being high up. Talking about being great for cats who enjoy high places… this one from Go Pet Club has a peak at 85 inches. Is that why it’s our number 1 pick? Not only. It’s just jam-packed with features and that really sets it apart from the other ones on this list. It’s got tassles for cats to attack, a water bowl for them to drink from, all kinds of places to hide in and jump to and from. There’s even a fish dangling from the top that your cat can hunt. ARGH I want to be a cat and play on this!! The dimensions are 33.5 x 35 x 85 inches. Although it looks narrow and maybe unstable – never fear. You won’t have any problems on that score. In fact, the whole thing is just higher quality than the competition. The materials are better quality and the response from cats – and their owners – is ecstasy. From the time I opened the box, my cat was all over this thing. I will definitely look at Go Pet Club stuff first because you get more than you pay for. Our kitten likes to start playing with the dogs then go up there and watch them when he is finished because he knows they can’t get him. We couldn’t find a video of this exact model, but this one is very similar. Watch Dobie – he seems to like it! 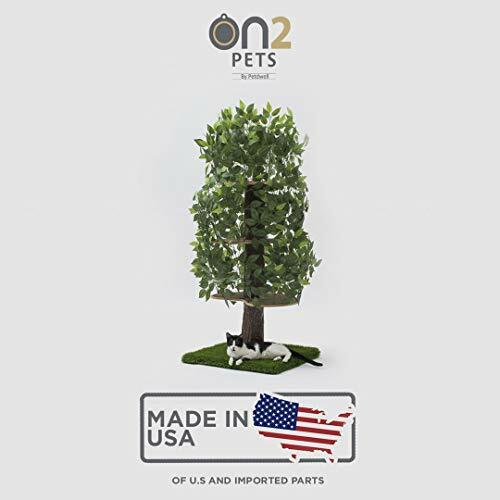 The best way to get a cat tree that looks like a tree is to build your own – you can take a small tree and add shelves to it, or custom build something using your own DIY skill and imagination. But if you just want something quick and simple, or don’t have time or the know-how to mess about with wood routers and whatnot, then buy one of the ones on our list. They provide an excellent way to get your pet moving and keep them healthy fit for years to come.